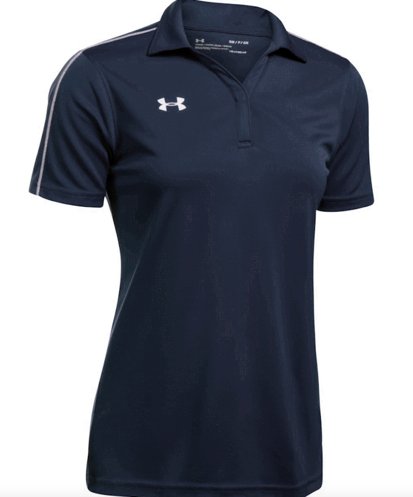 We offer Under Armour polo tees in Men’s and Women’s cuttings for customisation. Besides the classic design of the polo tees, the fabric is of high quality with moisture wicking properties which is an important feature for sportswear. High quality fabric and classic design matched with a good size fitting makes a premium polo tee. A bad or low quality fit for a polo tee tends to make the wearer look sloppy. This is what we do not wish for our customers to experience. We encourage customers to pay attention to the details of the size chart before placing their orders. Under Armour Singapore polo tees and Under Armour Singapore running tees are of the “Loose” fit – a generous, fuller cut for maximum comfort. It provides the maximum range of motion and breathability for the wearer. Under Armour Singapore prides itself on empowering athletes to excel and do better. The fitting of the Under Armour running tees and polo tees gives athletes an extra edge. Under Armour polo tees and running tees are designed to be consistent with the typical sizing specifications, thus if you usually wear “S” size, most likely you are also a “S” size for Under Armour “Loose” fit tops. 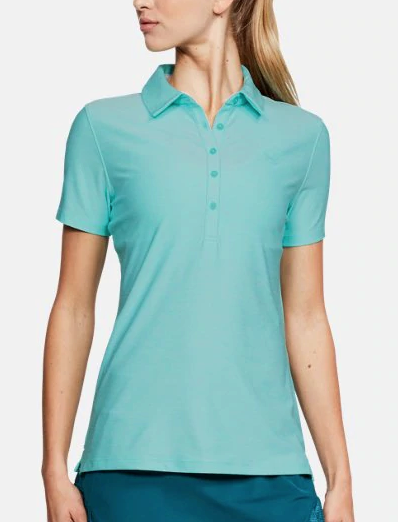 Some customers have let us know that the Under Armour Singapore “Loose” fit polo tees is comfortable around the stomach area without it being too wide at the shoulders, the polo does not droop down at the shoulders area – which prevents them from looking sloppy yet provides unrestricted movement. This is great for golf polos as golf players will need to be able to execute golf swings smoothly, without being restricted, at the same time, look smart and neat. Under Armour Singapore has 3 types of fittings across their apparel range, they are “Compression”, “Fitted” and “Loose”. Many reviews express that Under Armour is true to size, which is something customers are happy about. For other sports brands, such as adidas, they offer “Regular”, “Tailored” and “Athletic”. The adidas “Regular” fit is a standard cutting while the “Tailored” and “Athletic” cuttings are designed to make the wearer look slim and trim. Similarly, New Balance’s fittings are “Fitted”, “Athletic” and “Relaxed”. 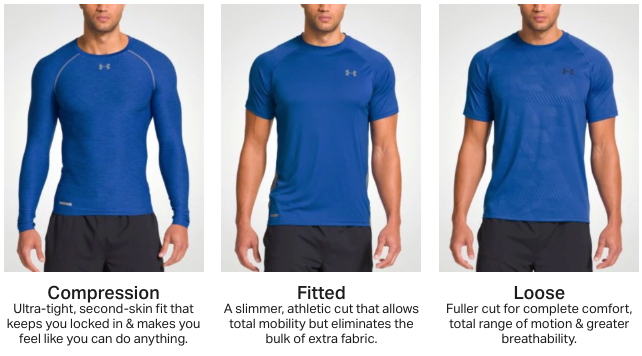 Under Armour’s 3 fittings, “Compression”, “Fitted” and “Loose” applies across all their tops, including Under Armour Running Tees. The Under Armour Locker Tees are of the “Loose” cutting, which are very popular for sports teams because the “Loose” cutting is comfortable and does not restrict movements. 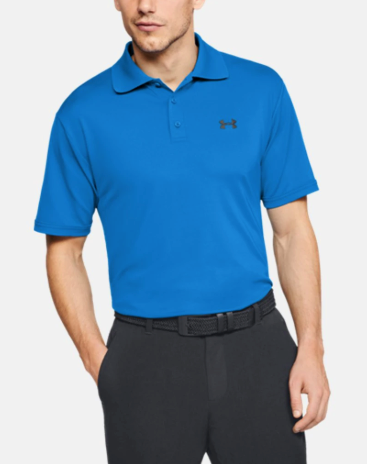 Similarly, for a great golf swing, the Under Armour polo “Loose” cutting allows maximum motion while keeping the wearer looking smart and trim. The Under Armour Singapore polo tee size cutting is based on the United States’ standards. We recommend our customers in Singapore to order a size smaller than their usual choice. For example, if you have been wearing a “M size”, we recommend for you to choose a “S size” for Under Armour Polo Tees and Running Tees. This recommendation is the same for both males and females. There are some size variations between Western and Asian size charts across all apparels. Feel free to make an appointment with our Sales Team and come down to our show room to try on the different sizes of Under Armour Singapore Polo Tee and Running Tee so that you feel more confident in placing your orders correctly. Simply call us at +65 6352 0988 or email us at info@ark.sg.